Interested in how to become a notary in Vermont? 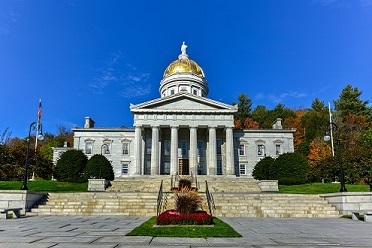 Are you a current Vermont notary that needs notary supplies or a Vermont notary renewal? If you answered yes to any of these questions you've come to the right place. Since 1940 NotaryBonding.com has been your one stop shop for providing everything from notary stamps to errors & omissions insurance for notaries in Vermont. Tradition of Trust & Integrity Empowering Vermont Notaries. We are your primary provider source for all your notarial and supply needs. Fax, mail, email, call or place your order online today. Our Vermont Notary Impression Seal Embossers have exceptional impression quality that leave a clear, raised and sharp impression every time. All impression seal embosser's measurements fully comply with state statutes. Our Vermont Rectangular Seal Stamps are made of high-quality materials and have outstanding impression quality. All stamp measurements fully comply with state statutes. Be a resident of the State of Vermont or a resident of an adjoining state who maintains a place of business or is regularly employed in Vermont. Be a resident of the county where appointed or maintain a place of employment or business in that county. Optional. Notary Service and Bonding Agency, Inc. strongly recommends that Vermont notaries insure themselves against claims of negligence. None Required. Notary Service and Bonding Agency, Inc. strongly encourages Vermont notaries public to authenticate every notarial act performed with an official seal of office. None Required. It is strongly recommended by the Vermont Office of the Secretary of State and Notary Service and Bonding Agency, Inc. that Vermont notaries public record every notarial act in a notary record book or journal. A $30 filing fee is required for new applications. Permitted. A non-resident individual may be appointed as a Vermont notary public, provided the individual resides in New Hampshire, Massachusetts, or New York and maintains or is regularly employed in a place of business in Vermont. A non-resident individual must apply to the county clerk of the county in which the business is located or where the individual is employed. A non-resident Vermont notary public is required to inform the superior court judge of any change in his or her residence or place of employment. To be reappointed, a notary public must apply for appointment and follow the same procedures required for a new appointment. Complete the Vermont notary public application and take the oath of office. Continue here to complete and print the Vermont notary public application. Please be advised that the appointment, certification, and oath are all contained in this application form. Complete the notary public application and take the oath of office before a current notary public or other officer as prescribed by law. Present the completed notary public application to the county clerk. Present the completed notary public application, along with a $30.00 filing fee made payable to the Superior Court of Vermont, to the county clerk in the county in which you reside, for filing and recording. This may be done in person or by mail. Your notary commission will become active as soon as your notary public application is approved and filed. Place your order for your new or renewal Vermont notary package or supplies. Once you receive your notary stamp seal you will be authorized to begin your notarial duties for the State of Vermont.